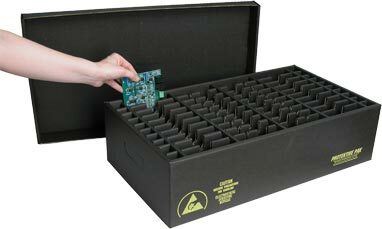 Choice for ESD Control Packaging? Why is Protektive Pak’s Dissipative Impregnated Corrugated Material the Best Choice for ESD Control Packaging? Coated material is simply a standard Kraft sheet with ESD properties painted or printed on the surface. This material is fragile and the ESD paint prone to scratch and rub off, for example, when leads from circuit boards scratch the side of the box or tape is removed from the exterior of the box. The more this occurs, the more compromised the material becomes making the sensitive components inside susceptible to ElectroStatic Discharge (ESD). shielding layer of our product. Tape removed from our Dissipative Impregnated Corrugated box and that of a coated box demonstates the buried shielding layer of our product. Carbon is added during the paper making process. The paper is a 6 layer process. The top surface layer is static dissipative, measuring 1 x 106 to < 1 x 109 ohms. The conductive layer is in the 5th layer from the surface measuring < 1 x 104 ohms. Material is coated or printed with carbon loaded black ink which is then coated with a clear sealer to help coating stay on. 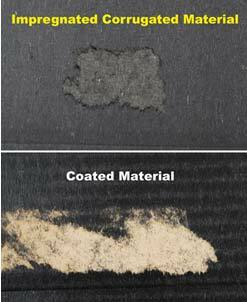 Shielding layer is very close to surface and high carbon content can bleed through. Result is poor and inconsistentstatic dissipative effectiveness. buried shielding layer provides ESD shielding, protecting contents from electroststic charges and discharges. Impregnated Corrugated material provides longer life with greater durability than painted materials. Abrasion test (test available upon request) of its thicker construction has shown no loss in particles at 100 cycles, only 1% loss for 200 cycles and 60% loss for 500 cycles. Similar tests have shown a 50% loss in particles in only 10 cycles and a 100% loss in 100 cycles with coated material. When our dissipative impregnated corrugated container is enclosed (such as a lid in place), the buried shielding layer provides ESD shielding, protecting contents from electroststic charges and discharges. Impregnated Corrugated material provides longer life with greater durability than painted materials. Abrasion test (test available upon request) of its thicker construction has shown no loss in particles at 100 cycles, only 1% loss for 200 cycles and 60% loss for 500 cycles. Similar tests have shown a 50% loss in particles in only 10 cycles and a 100% loss in 100 cycles with coated material. State-of-the art technology is used by adding carbon during the paper making process. The paper is a 6 layer process. The top surface layer is static dissipative measuring 1 x 106 < 1 x 109 ohms. The conductive layer is the 5th layer from the surface measuring <1 x 104 ohms. Burying the conductive layer under a dissipative surface reduces the potential for a rapid discharge when contacted by a charged device. Manufactured by one paper mill using computerized controls also ensures consistent quality. In addition, our Impregnated Corrugated containers are built to withstand the abuse of transportation and continuous reuse, making them potentially the least expensive packaging choice over time. Also, because the shielding layer is built into the corrugated material, the boxes will maintain a quality appearance much longer than painted or coated product as the black dissipative material will not flake off and reveal the brown corrugated material underneath. by Packaging standard ANSI/ESD S541.